For a generation of moviegoers, the FirstLook vignettes that precede a feature have become an integral part of the cinema experience. In fact, for some, the series of behind-the-scenes shorts and commercials are as anticipated as the previews of upcoming films. FirstLook is the brainchild of 1984 The Alligator alumnus Cliff Marks, who created it in 2002 to simultaneously engage and advertise to movie audiences as president of National CineMedia, the largest cinema advertising network. Marks, originally from Aventura, Fla., always has operated on strategy, and he knew early on that he wanted to go into advertising. He didn’t know where in the field he belonged until he enrolled at the University of Florida and jumped on the advertising track in the College of Journalism and Communications. In Dr. Joe Pisani’s media planning class, it hit him “like a ray of sunshine” — he was a media guy. In 1981, Marks was hired in the ad sales department at The Alligator. The year The Oaks Mall opened in Gainesville, Marks and a then-30-something Patricia Carey (current general manager of The Alligator) worked on a 24-page advertising section for the back-to-school issue that August. The toughest sell was to a mom-and-pop framing store. “What are you going to do? What will the creative be?” the owner asked him. He went back to Carey, who, unknown to some, is an artist. She hand-drew a funny picture of someone trying, unsuccessfully, to put something in a frame. The headline: Don’t Frame Yourself. Marks convinced the owner to buy a quarter page, which also offered students a 25-percent discount. It’s one of his favorite memories. Often it’s difficult to know the success of a particular ad. In this case, students walked into the store waving The Alligator. After graduating from UF in 1984, Marks moved to New York and got a job at the worldwide agency BBDO as an assistant buyer, working with companies such as Quaker Oats, Stroh Brewery and Pepsi. (“I believe my experience working at The Alligator was something that was well thought of by the people I was interviewing with,” he said.) In 1986, he left to work at Young and Rubicam, where he worked on Kentucky Fried Chicken and Lincoln Mercury. 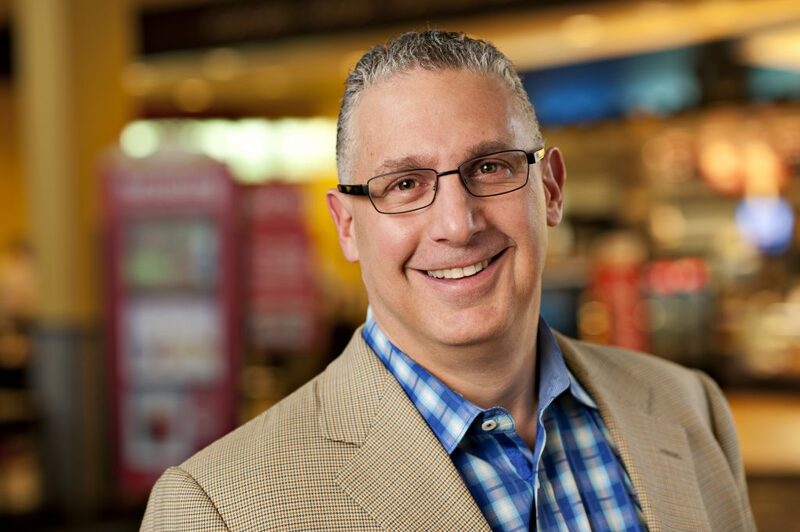 In 1989, he went to ESPN as a salesperson and watched it transform from a network to a brand. During his time, it launched ESPN2, ESPN Magazine, ESPN.com, ESPN Radio. He wasn’t looking to leave, and he certainly wasn’t looking to start his own company, but in 2002, he was recruited to start a cinema advertising company, National CineMedia. He didn’t even know what movie theater advertising was. Spoiler alert: It was a great move. There wasn’t much competition in the early days. The difference between the cinema and other media is that it doesn’t have what he calls a MIGA, or “make it go away” device. If you don’t want to watch a commercial on television, change the channel. On the radio, push a button. On the internet, hit an ‘X.’ In a magazine, turn the page. In the movie theater, consumers can’t make it go away — and it’s on a 40-foot screen. Today, NCM is competing against new digital video mediums: Facebook, Google and Snapchat are competitors as much as ABC, Discovery Channel and ESPN. It’s this focus on the future of media that keeps him connected to UF. He works on a committee with Dean Diane McFarlin to help the College of Journalism stay au courant. He also tries to come in to lecture once a year. Alyssa Fisher was The Alligator’s Fall 2015 editor-in-chief. 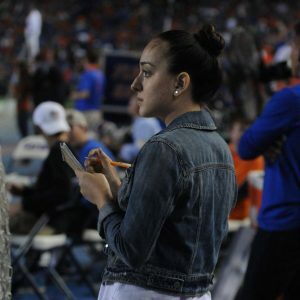 The 2016 College of Journalism alumna is currently an assistant editor at Lifestyle Media Group, the fastest-growing publisher in South Florida with nine titles spanning the tri-county area. It’s quite a range of magazines, so she strives to accentuate each community’s identity. Before getting hired at LMG, she was a features intern at The Buffalo News. She also freelanced for Gainesville Magazine and interned at ELLE Magazine and a media company in Tel Aviv, Israel. Alyssa relishes the spontaneity of journalism, and she has a tendency to wander and fall into deep conversations with strangers. Follow her on Twitter, @AlyssaLFisher, and connect with her on LinkedIn. She’s on the lookout for a great coffee shop, so reach out if you’re in the area!